The market numbers, pertaining to the regional as well as country level data and various segments i.e. end-use industry are estimated through the combination of primary and secondary research among target regions and countries. The base year volume data is arrived at through collecting and analyzing the historical market information as well as through the multiprolonged hypothesis generation, triangulated from the details collected/benchmarked from the country or regional level sales volume and collaborated from the supply side statistics. Key sources referred to arrive at the global salt hydrate market size includes: salt hydrate manufacturers, suppliers, end-users, industry association & trade experts, along with the secondary documents, available through public domain, paid database, and PMR’s in-house data repository. In order to offer accurate market forecast, PMR’s proprietary regression analysis forecast model was then utilized to derive the market estimation for forecast years, which takes into account effects of certain direct and macro-economic factors having impact on the global and regional target market. The pertinent opinions of key primary respondents for specific segments and geographies, are also taken into consideration for forecasting the segment level market size and dynamics. 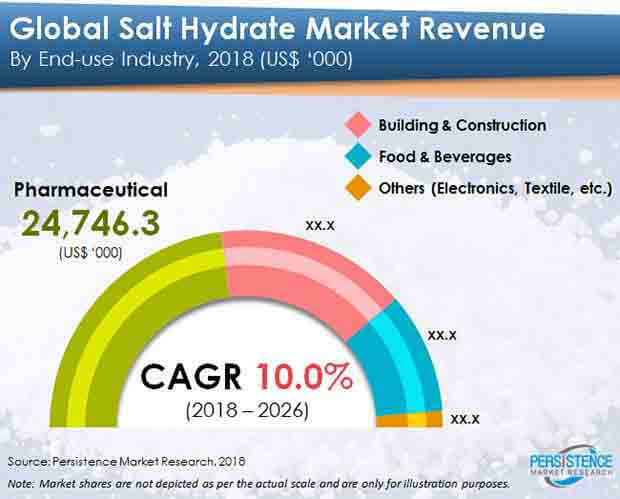 In order to understand the market segments in terms of growth and consumption of salt hydrate across concerned regions, Persistence Market Research has developed the attractiveness index, which will help providers to identify real market opportunities. The Salt hydrate market report by Persistence Market Research covers information about market trends, volume (tonnes) and value (US$ Mn) projections, market dynamics and recent developments in the global salt hydrate market for the study period 2018 to 2026. Salt Hydrate consists of inorganic salts and water. Salt hydrates have high latent heat of fusion, higher thermal conductivity than paraffin, small density changes and are slightly toxic and corrosive but compatible with plastics. The global Salt Hydrate market is estimated to have been valued at 49,445.6 ‘000 US$ at 2017 end and is expected to reach 115,136.1 ‘000 US$ by the end of 2026 while expanding at a CAGR of 10.1% over the forecast period. The global Salt Hydrate market is anticipated to represent incremental opportunity of 61,283.5 ‘000 US$ between 2018 and 2026. Increase in the food & beverage production across various countries is expected to push the demand for warehouses and cold supply chain facilities. With the increase in number of cold supply chain facilities, the demand for salt hydrate based phase change materials is also expected to grow, which, in turn, will drive the global salt hydrate market over the forecast period. Salt hydrates are one of the most promising cold storage media for air conditioning systems and heating and cooling applications owing to their high energy storage density and capacity to store energy at near constant temperatures. Apart from their application in freezers, salt hydrates are also used in air conditioning systems and cold storage systems as their temperature is similar to the temperature of evaporation refrigeration host and their density is higher than water. In various residential as well a commercial buildings, it is important to maintain temperatures during summers as well as winters. Hence, the researchers have developed salt hydrates that are suitable as storage materials in centralized cold storage systems and chilled ceilings. Amongst all end-use industries analyzed in this global salt hydrate market study, the others segment which includes electronics and textile industry is expected to register about 2.2X growth in terms of value. In the recent past, utilization of PCMs in heat transfer applications and textile substrates has been enormous in terms of quantity. In terms of incremental opportunity, Pharmaceutical & Building & Construction segments, together, are expected to account for more than 75% of the overall incremental opportunity created during the forecast years in the global salt hydrate market. Introduction of stringent environmental regulations pertaining to energy storage systems in buildings is expected to push the demand for phase change materials, such as salt hydrates in Europe. South East Asia & Pacific region is expected to register 2.5X growth in the salt hydrates market. Various countries, including India, China, Japan, etc., are expected to show significant growth during the latter half of the forecast period in the salt hydrate market owing to the increase in demand from manufacturing sector as well as pharmaceutical transportation sector. All the other regions are expected to exhibit relatively moderate growth over the forecast period in the global salt hydrates market. Some of the participants involved in the global salt hydrate market and included in this report are Salca BV, Phase Change Products Pty Ltd., PCM Products Ltd., Rubitherm Technologies GmbH, RGEES, LLC, Pluss Advanced Technologies Pvt. Ltd., Climator Sweden AB and others. The global salt hydrate market is fragmented, with top 5 players holding a small part of the overall market. Globally, top 5 players in the global salt hydrate market collectively hold more than one fourth of the overall market share. In the recent past, the salt hydrate market has witnessed significant developments from a competition perspective. Product innovation and collaborations are some of the key strategies opted by key players to sustain and expand in the global salt hydrate market. How the salt hydrate market has evolved in the past four years? How the salt hydrate market is expected to take shape in terms of volume and value during the study period? What are the prevailing market dynamics in the salt hydrate market? What are the competition developments and trends in the salt hydrate market? What are some of the underlying macro-economic and industry factors impacting the growth of the salt hydrate market? Which are some of the key challenges, opportunities and improvement factors for market players? What are the market positioning and key strategies of key manufacturers as per the market taxonomy? How the competition is structured and has evolved in the salt hydrate market over the past few years?